We need less talking and more playtesting! Please correct me if I am wrong, I haven't read the whole thread, but I don't seem to recall you doing much for the project yourself. This isn't what the Judges do all day you know, they have lives. Now be nice, Hive Lord. We love all our adoring fans, even the impatient ones. I have both and they both look amazing, you can also buy him unpainted and paint it the color your choose. Also, many of the "new" paint schemes have been around since their release. A two-figure melee squad? With only three attack and two defense? And no bonding? How can that work? Of the few two-figure squads in official 'Scape, only one is melee (Death Knights of Valkrill), and they have five defense and bonding. Low defense melee units usually have high attacks (Macdirks, Death Chasers) or lots of potential activations (Ashigaru Yari, Venoc Vipers) to make up for their fragility. 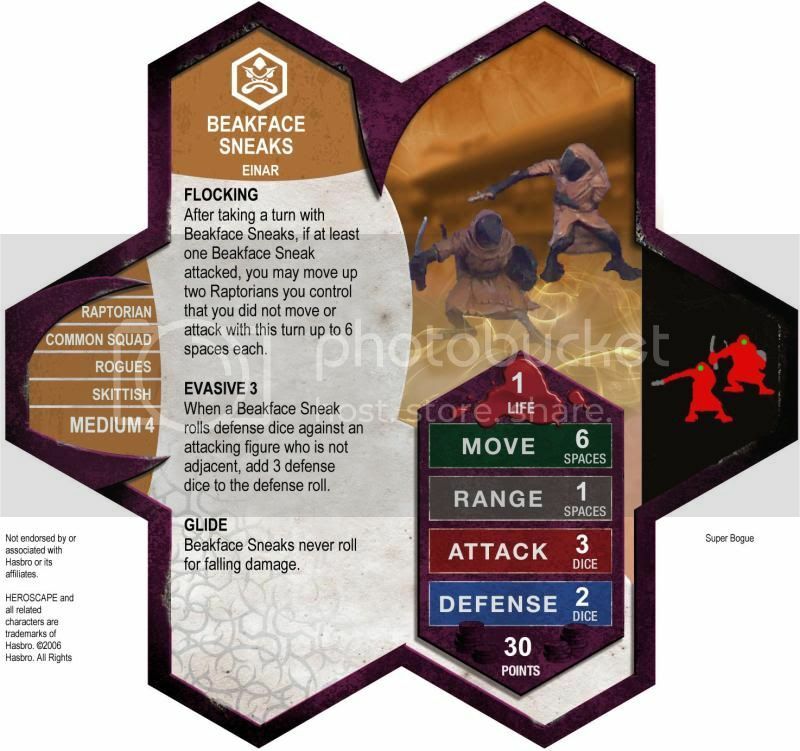 While they do have the very helpful Evasive 3, the Beakface Sneaks have an ugly combination of a low number of mediocre attacks and poor defense. That certainly justifies their low cost. But are they effective? See the Playability section. These two figures look great together as a squad. Aside from both of them being kenku, they are wearing similar outfits that are the same color. The theme of sneaky rogues also fits the sculpts very well. I do not like the Skittish personality as that is not how they need to be played to be most effective -- in terms of playstyle they are quite aggressive. The powers, particularly the naming of the powers, fits them quite well as well. I do not like that they are Raptorians (as opposed to, say, Kenku). But there are reasons for the raptorian designation which I will not hold against this unit. Regardless of exactly which faction they belong to, Flocking creates serious limitations for the faction. It allows any two raptorians to move up to 6 spaces, hero or squad member, unique or common, Beakface or something else. Any future additions to the faction will need to be very careful that they are not given too much of a boost by the Beakface Sneaks. Additionally, future units will almost necessarily have to have at least 6 move, otherwise the bonus movement given by the Sneaks might seem out of place. As much as I am normally a stickler against powers that limit future designs, I'm actually ok with Flocking. I really do not expect us to expand the raptorian faction much more due to a lack of useful scuplts, and Flocking is an interesting power that can work as a way to pull the faction together. Creating a common melee squad without bonding earns some creativity points in my book, and Super Bogue went much farther by creating a squad that is weak in both offense and defense. It's really the right thing for these scuplts and the unit plays differently than anything in official Heroscape or existing Fanscape. I loved the concept since I first saw them. At the time of this writing I see over 150 Kenku Sneaks listed on abprices.com. The Kenku Warrior, on the other hand, only lists around 60. This is on the low side, especially considering they are a cheap squad that works well in horde builds. It's high enough for me, but my fellow judges might ultimately disagree. The Beakface Sneaks are not to be underestimated. They may see a little success in small numbers as a first-strike unit or range assassins due to their speed, but the Sneakbeaks real strength lies in numbers. While they do not get many attacks and they do not last long once in combat, their speed combined with Evasive allows them to hit the enemy before the enemy is set up and Flocking allows them to keep up the pressure. And that's what they really need to do to win against many other armies -- hit hard and fast and keep on hitting, not unlike other shark units such as Vipers. They may not last long once in enemy territory, but there are almost others right behind ready to strike. I was quite surprised when 300pts of Sneaks took out 300pts of 10th Reg in three games out of three (all very close), and also surprised when I found them able to go toe-to-toe with mid-level melee armies like Marro Drones (depending on the d20) and Sentinels (depending on the defense dice). I was worried they were perhaps underpriced (! ), but they do poorly against most melee bonding armies like knights and orcs and they have no way of dealing with screening units like Deathreavers. Their cheap cost has limitations on many maps as well; at 15pts per figure they can fill up a starting zone quickly. As they are I find them effective with some big weaknesses; perhaps with future raptorian synergies that shore up some of these weaknesses they could become a real force. Along those lines, I was concerned that allowing Flocking to move raptorian heroes could become too powerful, or at least limiting for future designs. After doing some testing along these lines (don't ask me how), I was convinced this is not as big of a concern as I feared. The Sneakbeaks really need to use Flocking to move more Sneaks to keep up the pressure as their front line tends to fall fast. Moving other units decreases their effectiveness by limiting the value of Flocking, and of course as sharks the Sneaks really want all the order markers. It's nice to be able to move other raptorians when you run out of Sneaks, and it does have some value when using small numbers of Sneaks as a first-strike unit or range assassins, but it is not as effective as a general-use ability as one would expect. There is one thing I do not like about how Flocking is worded: you can attack one of your own units with a Sneak to activate Flocking. This was never actually a concern for me in the games I played, but I generally dislike abilities than can potentially be abused by attacking one's own units. But it is not something easily abused -- you would need to send out a defender first just to have something to swing at safely -- so it's not enough by itself to make me vote the unit down. I would like to see more raptorian units in the future incorporate Flocking. That could really change up the effectiveness of the Sneaks to allow them to mix in to a broader army as range killers instead of primarily as sharks. Regardless, for what they are now they are pretty neat. I had a blast playtesting the Beakface Sneaks. I was amazed at how effective they are despite being a two-figure melee squad with weak stats. They like to strike hard and fast and prevent their opponent from getting set up. Against range armies without a screen they are frightening, but they have a hard time against strong melee armies. The game does not have enough anti-range melee units and these guys fit the bill perfectly (pun intended). I vote to induct the Beakface Sneaks into the SoV. For what it's worth there are more Kenku Warriors available than listed on AB Prices. Neither Miniature Market or Alter Reality Games are listed and they have 68 currently in just those two stores alone. I was wondering if anyone has gotten to time to do anything with Rorshack yet? I'm not asking for details or a battle report, just a show of hands really. Hope this isn't presumptuous. Everyone loves ninjas unless they are Heroscape ninjas. Aside from a certain cheap-as-dirt Twilight Clan assassin, the ninjas of Heroscape range from mediocre to bad with no significant synergies. Dashi Tokainto attempts to pull the ninjas together into a cohesive, competitive army. There aren't many official Heroscape units to compare with Dashi Tokainto. Kato Katsuro, Kurrok, Ornak, and Ulginesh all provide multiple activations of other units. Of those, Kato, Kurrok, and Ulginesh are all fairly costly considering their stats and their other abilities (Ornak's command ability is limited), which gives us a precendent for Dashi. A single-attacking melee figure with only two attack is pretty bad offensively, even with Phantom Walk. Counterstrike with five defense is quite valuable, but the Izumi provide that for half the price with improved offensive output. Together this all means that most of Dashi's value is in Dishonorable Leadership, as it should be. To be honest, I was not thrilled to see a unit that pulled the ninjas together. I liked the ninjas as individuals (and a unique squad), even though they were (mostly) terrible. But if they were to have a leader, Jonin is a good choice of class (literally meaning "High Ninja"). The name Dashi Tokainto is a bit off to me for two reasons: 1) It doesn't sound like any Japanese name I've heard (I kept wanting to call him Daishi Tokanto), but I'm just an anime geek and not an expert on Japanese names by any means. 2) All Heroscape ninjas have only one name. Samurai heroes and the daimyo have both a given name and a family name, but Dashi fits more closely with the ninjas. While I'm not thrilled about the quality of Heroclix figures, especially alongside Heroscape ones, this figure looks great standing alongside the others. He definitely gives the feeling of a mastermind in the shadows. I can't say I like the choice of general. A Disciplined figure for Valkrill just seems ... wrong. The figure does have an evil vibe, but a leader for the ninjas does not have to be any alignment in particular. I would have prefered Vydar, mostly because I've always felt that ninjas would best fit Vydar's tricky leanings and mercenary behavior, and partly because I think the gray cloak would fit nicely in the Vydar color scheme. While these are negatives, none of them are deal-breakers, and even combined are not enough to sway my vote one way or another. Mostly just personal choice. For the most part the total package works as a leader of the ninjas that works from the shadows. Big points on the creativity of the design. Dishonorable Leadership, while very similar to other command abilities is also distinctly different, enough so that Dashi plays quite differently than the other commanders. I also really liked that qt kept his attack to a surprisingly low 2. It seems a bit odd thematically, but it makes the figure much more interesting to play. Counterstrike (should be Counter Strike, actually) works well for the figure too; combined with Phantom Walk there is not a dire need to keep him hidden from enemy units. Accessibilty, at this time, is not good. Both the League Assassin figure and the League Elite figure can be used, but from looking around online I've only managed to find a few dozen, mostly from eBay stores. Dashi is a unique hero so I'm ok with what I am seeing, but unless I'm missing something availability is on the low side. As I said before, I was not excited to see a leader figure for the otherwise individualistic ninjas. I was honestly surprised when I found myself loving Dashi from the first time I tried him. The ninjas in Heroscape have long been sub-par units that are difficult to field (with Isamu being a major exception). While they may have some useful abilities, they tend to only be situationally useful, and thus difficult to use effectively with order markers. Dashi Tokainto removes their order marker restrictions and allows them to act when they are most valuable. Otonashi's Tricky Speed and Attack the Wild are good examples of this. Kumiko's special attack is somewhat situational as well. Shiori is the big winner; put the 'X' order marker on her and she becomes a potent asset. Moriko is ... still Moriko, but at least when activating her she only uses up half an order marker. Order marker freedom and double activations gives the ninjas real potency, especially as assassins. Using Phantom Walk they can get to the key support figures and (partly due to multiple activations) cut them down. Disrupting enemy plans is where the ninja team is at their strongest; otherwise point-for-point they don't have the defense and life to stand against most squad-based armies. The bit that makes Dashi play very differently than other leader figures is that Dishonorable Leadership allows Dashi to take a full turn before activating other units. This primarily allows the Jonin to reposition to be in clear sight of the figures he wants to command, or to sneak away from enemy units to a safer position. While at first it may seem like being able to activate three heroes per order maker is too powerful (Dashi + 2 Ninja heroes), the feature that holds this combination back is that Dashi must be unengaged to be able to command. Being a melee unit with a weak attack of two, it is dangerous to attempt to engage an enemy unit to attack; a failed attack means no ninjas get activated. It may be worth the risk against squad figures with weak defense, but outside of that the risk is too much for the possible reward. Thus Dashi's turn is almost always used simply to reposition. Not that DT is especially weak; Counter Strike gives him some ability to hold key positions. It is a risk, of course, but the ninja army needs to take risks to win. Still, once the rest of the army falls, Dashi struggles to clean up with his weak attack. Five defense and Counter Strike is nice, but is far from invincible as any Charos player can tell you. Dashi Tokainto plus all the ninjas make a potent 500 point army. Not quite strong enough to be a top tournament contender, but strong enough to win games against most weaker tournament armies. They are also quite good in a heroes-only environment (minus the Northern Wind). There is one thing about Dishonorable Leadership that bothers me. Since it is lacking the "after revealing an order marker" clause, it opens up potential bonding chains. I do not see such a chain as likely given the left-side stats, but it is something that future Fanscape creators would have to keep in mind. Dashi Tokainto attempts to unite the ninja faction and does so wonderfully. With him at the helm the ninjas become fun to play and rather potent. While there are some things I don't like about the theme and the wording of Dishonorable Leadership, I believe Dashi would make an excellent addition to Fanscape. I vote to induct Dashi Tokainto into the SoV. Last edited by Scytale; July 24th, 2012 at 01:55 PM. It seems like you found a lot of minor negatives, but playability was great as well as creativity. Would it be worth it to resubmits this custom with those minor suggested changes (name, general/personality, wording) to present a more thematic but unchanged playability-wise custom? Well, it would get an automatic from me, I suppose, but that's not normal procedure. The SoV is meant to be a final stamp of approval, not a playtesting department that helps workshop a unit. Most of my concerns were matters of personal choice; this is qt's unit and he should make it as he sees fit. Some things, like the change I'd like to see to Dishonorable Leadership, could potentially be changed post-approval in Editing since it doesn't change the unit. Overall, Gor'Vath is a good design but suffers a dilemma that maybe solved one day. But as long as there is the conflict that Killometer previous noted, I vote NO to inducting Gor'Vath into the Soldiers of Valhalla. While I think there are some precedents set with glyphs, units like Raelin, Zelrig and such and factors like height and all I understand the math considerations. I will say that it is disappointing that this factor wasn't brought up as an issue on the previous version of Gor'Vath as it could have been modified in some sense to make adjustments. I suppose I could make them now and resubmit again, sadly the SoV process being what it is I may have to wait until 2014 to see whether that version goes forward any more. ...sadly the SoV process being what it is I may have to wait until 2014 to see whether that version goes forward any more. Have a bit of faith, three reviews in the past ten days, that's practically an avalanche! Things are looking up around here.